A revolutionary design bringing tail cuff blood pressure testing to another level. IITC the true "Gold Standard" and still world leader in mouse and rat tail cuff blood pressure measuring systems for preclincial research. IITC has once again designed a first for laboratory research equipment a true turn-key system when it is key critical for determing accurate, consistent blood pressure on mice, rats or any other laboratory animal test subject. A true, compact, simple yet versatile system that can test from a single up to 200 animals at a time with independent control of each channel. Simple daisy-chaining of systems allow expansion of systems, up to 200 independently, controlled channels. 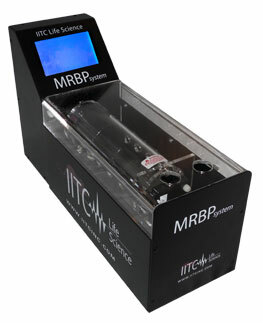 No other system in the world has such vast capabilities as the IITC blood pressure systems. Single animal systems are controlled from the touch screen which allows keying in all necessary test setups. These new mouse and/or rat blood pressure systems have all components now built into 1 small unit. Controls, inflation of tail cuff, built-in low temperature warming environment with whisper quiet fans has finally been designed to allow you the user an ideal system for teaching facilities and for the pharmaceutical industry when high through-put is a must. Methodology is still the only low temperature "validated" tail cuff method that is world reknowned for accuracy for 37 years. Touch screen control allows ease of operation supplying automatic evaluation of test results - systolic, diastolic, mean and heart rate. No need for pulse calibration of the systems, analog outputs standard for both pulse and pressure. Data is collected, stored, displayed and can be transferred to the supplied memory stick. USB allows for software control for multi-channel systems and for single animal systems software is supplied enabling users to view and export data collected. Cleaning of systems are an ease, removable trays are supplied standard with each system when needed. All systems are supplied with a standard 2 year warranty. Lifetime warranty on all IITC sensors.